California will become the first state to eliminate bail for suspects awaiting trial under a bill signed Tuesday by Gov. Jerry Brown, but it’s still unclear how the risk-assessment system replacing it will work. 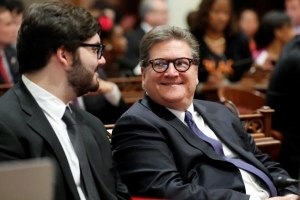 “Our path to a more just criminal justice system is not complete, but today it made a transformational shift away from valuing private wealth and toward protectingpublic safety,” the law’s author, state Sen. Bob Hertzberg, a Democrat from Van Nuys, said in a statement. L.A. County Sheriff Jim McDonnell hasn’t seen the final language of the bill however said a risk assessment tool looks at characteristics of an individual and if they are likely to reoffend. According to the bill, most suspects accused of nonviolent felonies will be released within 12 hours of booking, while those charged with serious, violent felonies will stay in jail before trial. “Trying to ensure that we get the best risk assessment tool that we can, I think, is a critical point to the success to this whole initiative,” said McDonnell.